The social media amongst Malaysian Sikhs went ballistic last night as word got around that the Sri Guru Granth Sahib (SGGS) was taken to night club in Kuala Lumpur for prayers, with a famous raagi jatha doing the kirtan. Overnight, Malaysian Sikhs began condemning the action, with group discussions over Whatsapp and Facebook all alight debating the action. Suddenly, the Moshi-Moshi night club – which promises a ‘brand new clubbing’ and the ‘craziest Bollywood’ experiences – was on the lips of even Sikhs who do not do clubbing. The spark that ignited the issue was the act of bringing the SGGS into the pub premises on the pretext of holding prayers on that Sunday evening. The night club owners had issued an apology for their actions on the same night, with a statement posted on one of the Facebook pages promoting the premises. In a impromptu meeting that same night, Sarabjit Singh Rangila Durgwale, the kirtani involved, had also apologised for what he termed as an error of judgment on his part, according to people who were present personally. When the word starting making its way via social media around 7pm, a group of young Sikh men had gone to the night club. “When we reached there, the prayer programme was about to complete,” said one of them when contacted by Asia Samachar. “We waited for the semaphti and then took Guru maharaaj [SGGS] to Titiwangsa,” he added. The SGGS saroop was brought to the premises from Gurdwara Sahib Titiwangsa, a gurdwara in the heart of Kuala Lumpur. 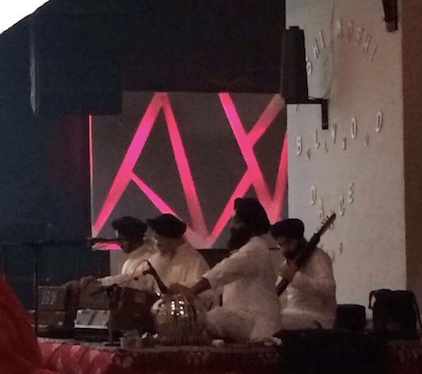 Later that evening, another group of Sikh youth had confronted Sarabjit after he had completed his programme at Gurdwara Sahib Tatt Khalsa, another gurdwara in Kuala Lumpur. “Some of the boys were quite upset, angry. We managed to calm them down. We told them to send five people to speak to Rangila,” said Baldave Singh Leo, an entrepreneur and a renown local kirtani, who happened to be at the Tatt Khalsa programme. Raagi Sarabjit Rangila performing kirtan at a night club. He subsequently apologised and said it was error of judgment. One of the questions raised was why the raagi agreed to the programme, keeping in view of a September 2013 Akal Takht ruling that the SGGS cannot be kept in homes with bars or where tobacco or intoxicants are consumed. Among others, the various postings on the social media have questioned the gurdwara for allowing the SGGS saroop to be taken to the night club. Questions are also being raised if any action should be taken againjst the raagi jatha. On his part, when confronted, Rangila had apologised and said it was an error of judgment on his part. “Although he didn’t know beforehand, he could sense it was not a proper place when he reached there,” according to a message from Balvinder Singh, a lawyer and also another renown local kirtani, who was also present at the meeting between Ranggila and the group of Sikh youth. Sarabjit apologised and said that on hindsight it was not right and he will be more vigilant, adds the same message. A Facebook account for Moshi-Moshi KL, which had been promoting the club events for some time, had posted an immediate apology on the same night of the event. Ragi Jathas. Shame on us for getting them into this mess. Not selling any alcohol or cigarettes? The presecne of alcohol or cigarettes itself in place where the maharaj is going to itself is very very wrong. Hope the world wakes up by their mistakes and this never happens again! Main culprit is the club owner, gurdwara committee, priest- they should know where are they going?? ?where are there pictures?? all kirtaniye are visitors- YES: he could have sensed out and that’s why he apologized. Main culprit should be the owner of that pub, gurdwara management. (president/priest) you should have post pictures of president, priest and owner of the pub also the sangat attended the program- where are they???? The club owner is ignorant but what about the so called preachers and leaders of gurdwaras …..don’t lead if you can’t understand or don’t want to follow the teachings and maryada… Practice what u preach. It’s time Malaysian gurdwaras hv a standard guidelines for committee members and granthis to follow and not do whatever they feel is right. It shamefull act. Let the committe decide. Club should be closed.Ranggila should be punished. The Sri Guru Granth Sahib Ji Beadbi that has taken place at the above pub refers. A meeting was held today at 2pm attended by sikh organization, namely SNSM, MGC, Niketan,SGGS Academy and committee members from titiwangsa gurd. After lengthy deliberation the meeting decided unanimously that it is best for the Panj Piaray to summon the relevant persons to appear at Gurd Sahib Titiwangsa at 8.00pm tonight(5th January 2015) to hear the case and decide accordingly. Balle Balle! New spot for Happy Hour. Chak De! How much per bottle there? Any idea what was the hukumnama for the jodmela? Interested in SGGSji’s take on this too. This total unwarranted and disgraceful episode transcends height of all ignorance and stupidity. Anyway the group and all involved have repented and asjed for forgiveness ; lets let the incident to rest and move forward to ensure that this incident is not repeated. Gurfateh . This Moshi Moshi KL club owners are scheming and shameless. First they copycat our Internationally renowned Club name, Moshi Moshi Bollywood Club in Singapore and played with the copyright and Trademark law by registering in Malaysia as Moshi Moshi Kuala Lumpur. But d name Moshi Moshi Bollywood is splatted all over their club premises. Our legal actions against them are still ongoing. Hopefully Malaysia Courts can expedite our case against them. Now they have shown total disrespect to d Guru Granth Sahib. They need to learn their lessons the hard way so that similar incidents don’t ever occur again. Shameless ! !